Powerful and reliable sealing and counting at the same time! 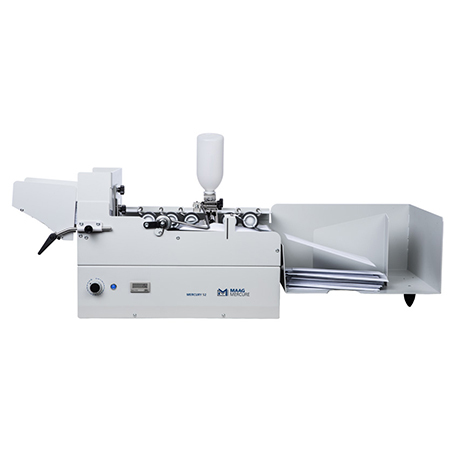 With this machine you are able to seal and count envelopes simultaneously. The machine with integrated counter can be used as a sealer and/or counter. Thanks to ist deeper design this new series "MERCURY S2" is particularly suited for all common standard envelopes with the formats C6, C5/6, C6/5, C5, B5, C4, B4, E4+C3 (with the flap on the length side). This series is equipped with the "piling option" as standard, which allows to seal normal stacked envelopes and nested envelopes. Depending on the version it can also be equipped with the integrated infrared photoelectric switch system for the automatic START / STOP function and/or an integrated (batch-)counter.